Thank You For Remembering Me! Oh Hallie, I just love my lipstick. Thank you for remembering me! to find a present under the tree. after all, you never lose your vanity! let’s get lipsticks for everyone! Please bring a lipstick for the ladies! And with that, a tradition was born. Well, girls, what can I say? For many of us, the trip to buy lipsticks became a defining moment of our holiday season. One friend told me she and the Bloomingdale’s saleswoman shed tears as they selected the colors, then added every powder, polish and perfume sample in the department! Thank you for remembering me. 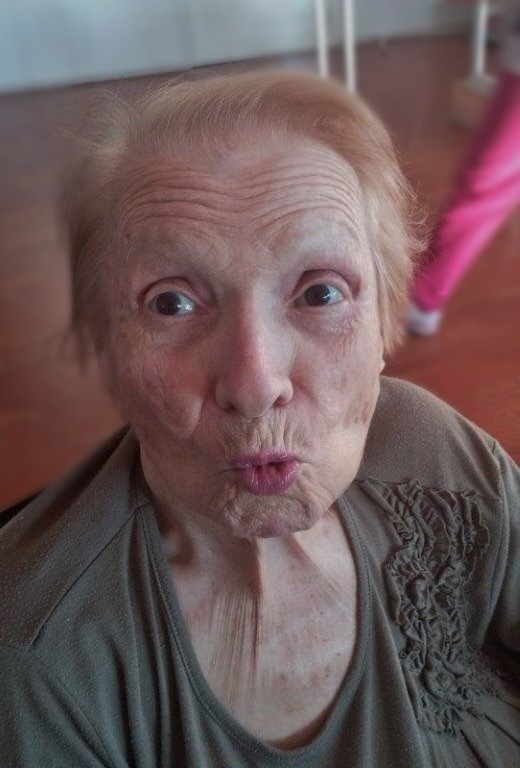 A reader in Arkansas has decided to be “Hallie’s Lipstick Girl” (her words) for her local eldercare facility. Thank you for spreading the cheer! And Merry Christmas! The beautiful woman in the photos is the mother of a friend from grammar school. Thank you for permission to use these wonderful photos and thank you to my friend’s daughter for taking such gorgeous pictures. This entry was posted in dementia and tagged Alzheimers, Christmas, Christmas presents, comfort, dementia, eldercare, elderly parents, gifts, lipstick, Mother, nursing home, Santa Claus, secret Santa by aswiftcurrent. Bookmark the permalink. What a great idea! I’m going to bring lipsticks to a friend and former teacher who has Alzheimer’s. I was just wondering what I could give her for Christmas! Thank You! It was my friend’s idea…and we adopted it with gusto! It sounds like a cliché to say their reaction was “magical”…but so be it…it was! 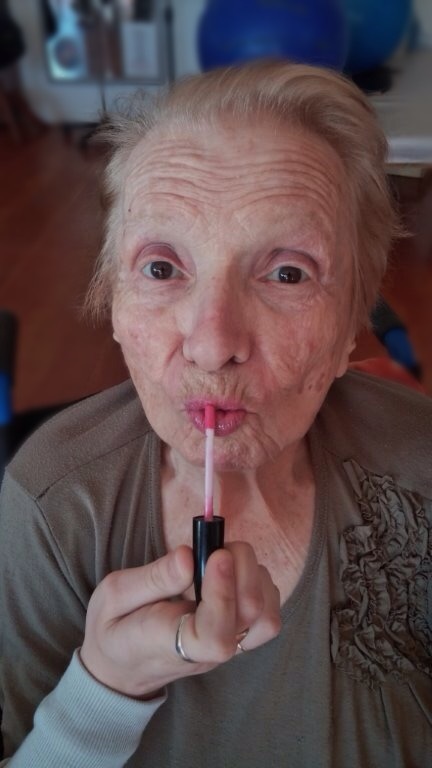 I am keeping my fingers crossed that this essay will inspire Swift Current readers to remember the ladies at their local eldercare facility…and that lipsticks are a good (and easy) idea! Oh, I just love this essay — both the wonderful holiday idea & the lovely writing! Wishing you the merriest Christmas & continuingly grateful for our friendship! Delightfully good news on a day where good news is appreciated. As always, your words are wonderful! My mom enjoyed her lipstick right up to the end…I kept a few of hers, just to remember how important lipstick was to her, and now is to me. Thank you for a wonderful, giving idea…the perfect way to celebrate the holiday. Looking forward to your new posts in 2015! It is something I think we take for granted until we don’t have access! But like your mom, even in her last years my mom carefully applied her lipstick–a vestige of a generation perhaps? How wonderful it would be if readers adopted the idea for their local care facility! I hope you and Anthony have a wonderful holiday…and I hope in some small way my story here will help ease your transition this year. As I wrote earlier, I found Christmas in the nursing home quite magical…the elderly/infirm look forward to the day–just like we all you do. I know you will be surrounded by love. When it all calms down, I hope you resume your writing. Your posts are powerful and insightful. Having a break will help us all catch up, I hope. I totally enjoyed this post! Funny that you should talk lipstick, because we took my Mother to the Nutcracker last weekend and she was telling me that she was not ready to go until she put on her lipstick! I realize that lipstick is one of those things that is a part of our lives as women regardless what age we are! Made me smile, from beginning to end. Thank you Hallie and Merry Christmas. I am happy that after all the tears, I can offer a post that brings smiles too! My mom always said the same thing; and reapplied after every meal! Lipsticks are a great idea if your mom has any friends at her living center who need something a little extra this holiday…even better than chocolate! And I think you should post every December, just a remainder of what Christmas is all about; bringing a smile on somebody’s face! What a beautiful holiday story! I love the lipstick tradition. Such a reminder that life is really happening at every age. Thank you for sharing your words and life.